Enactus, formally known as SIFE, is an international NPO supported by KPMG spread across 36 countries, with over 144 local chapter in India. It has over 72,000 students, working on over 3,800+ projects annually. Enactus students are focussed on improving the lives of the weakest through social entrepreneurship, building partnerships with local NGOs, Corporates and Governments to sustain their projects & more importantly, to bring a quantifiable change in the society. Entrepreneurial: Igniting business innovation with integrity & innovation. Action: The experience of social impact that sparks social enterprise. Us: Student, academic & business leaders working to create a better world for us all. Delhi College of Arts & Commerce is a premier instution of higher learning, a constituent college of Delhi University. 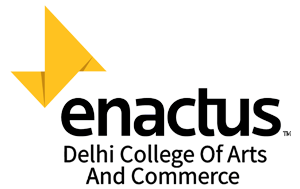 Enactus, Delhi College of Arts & Commerce was founded on the 1st of January 2013 & since then, we have successfully implemented & sustained 4 projects, impacting over 1 million lives, sustaining more than 120 livelihoods through its community driven projects. It is also ranked among the top enactus chapters across the country.